Did Falkie just describe the intimate moments he has with Kathy? Senda has said, “root canals don’t work”. I am enjoying your ONeill period. Is this likely to become a long lasting movement or just the occasional ode? I will try to supply gifs until ONeills' return. Maybe George should consider quitting reading books. They don't seem to make him any smarter or more interesting, and just clutter up his house, and collect dust. 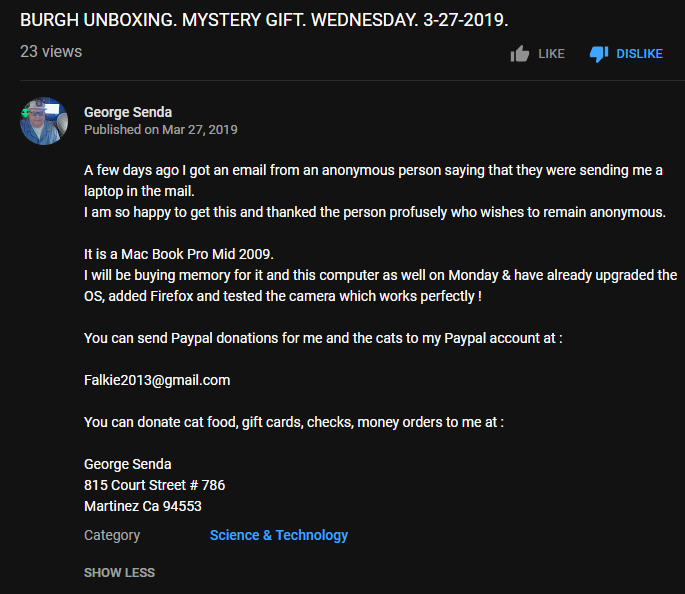 Does anybody really believe somebody sent George a MacBookPro as a mystery gift? As a side note: He looks all bit up by sumpthin. Does this look like the MacBook Pro he claims he got sent as a mystery gift? Does anyone have his address handy? I don’t want to try and track it down by watching his videos, ‘cause I’ll get a headache, but I’ve got half a notion to send him a 2012 iMac that I’m about to e-waste just to see what hijinks ensue. In Georges comment, under his video, he says he found out it's a 2009, but honestly, it looks pretty new, and he DID show us that it works, and has 5G wifi capability, to which he connected on it. I don't think 2009, or 2012 devices have 5G wifi capability. I could be wrong My older phones and computers only connect on the 2G option. I was half expecting Senda to be up all night live streaming on his new MacBook, connected up to his 5G wifi. I’m sort of shocked no one has offered Kathy $50 to $100 for a tell all interview. I think she would jump at the chance. Yeah, no doubt, she has never heard of the GabCast. What a shame. And even if she has, Senda probably wouldn't allow her to call in without himself standing next to her telling her what to say. He's savoring the chip, studying the interplay between flavors. Possibly trying to discern l'appelation d'origine and shutting his eyes in attempt to imagine, virtually transporting himself to the unique Idahoan terroir where that potato was grown. Nice Rally! I subscribed, so keep em coming! At the time, I had the impression that he was trying to meld himself with the cosmic origins of the potato. I LOVE the quarters video You do flea marketing I think you said, so some vids of your treasure finds would be great too. Some of your best finds and sells etc. There will be no treasure hunting vids because I do not do that. I will not be able to show alot of the place because I am busy selling plus my phone is my camera as well as my credit card machine. So I need it for that. But I fully intend to show some of what I can get filmed. Tours of my booth and around it for sure, hopefully more but it depends on the customer activity. GREAT! I love that kind of thing, and it seems very popular.